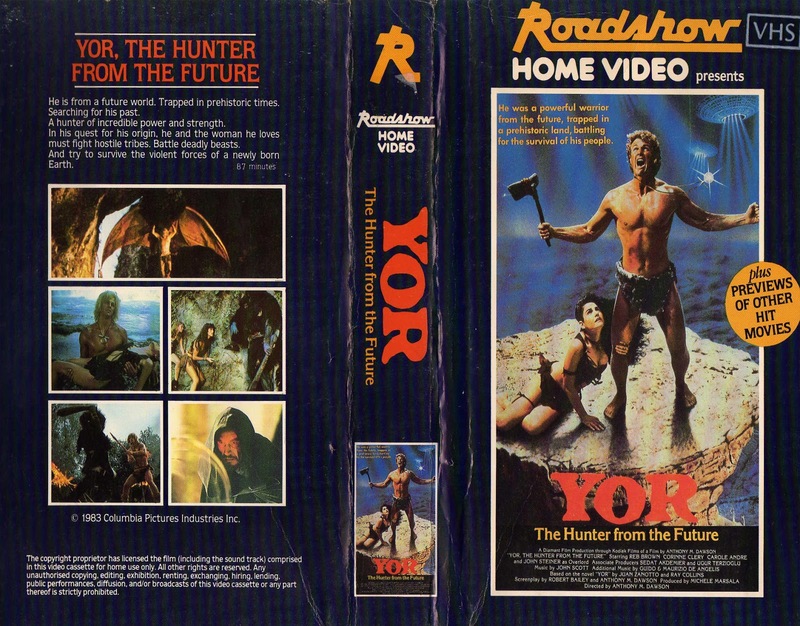 Yor (Brown) is a warrior from a prehistoric (?) time who seems to be the first person to invent ab crunches. At first he is content to go about his day fighting dinosaurs, fighting ape-like creatures with purple skin, and spending quality time with Ka-Laa (Clery) and the elder Pag (Pigozzi). But when a futuristic device appears that looks like a modern-day GPS, Yor begins to question his entire existence. 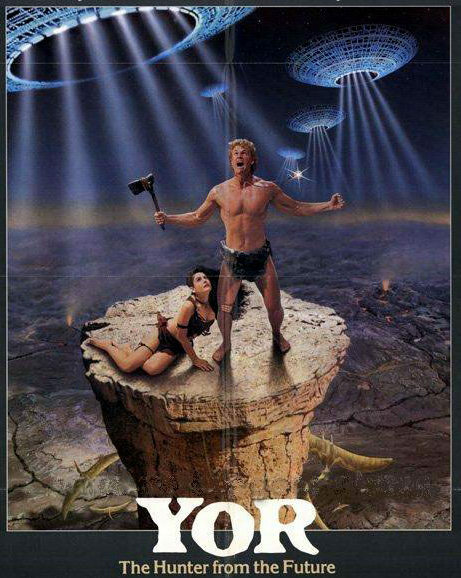 Before you can say “oiled-up dude in a loincloth”, Yor and his friends are transported to some sort of Star Wars-like future world, complete with an Emperor (Steiner), who is called “Overlord”, and Stormtrooper-esque baddies with masks reminiscent of Darth Vader. Surely Yor is confused, but he must protect his allies and fight the baddies, all while trying to discover the secret to his origins. Can he do it? Yor is a video store classic that anyone with a sense of nostalgia for that place and time (the 80’s, and video stores) will surely appreciate. In that classically Italian way, the movie is sort of a melange of the popular things of the time, such as the Star Wars series and He-Man. Throw in a little The Gods Must Be Crazy (1980) and maybe a little Caveman (1981), put in a blender with some alcohol, and there you have it. While I don’t know this for sure, I would guess that this isn’t director Margheriti’s favorite from his own work (it was also based on some graphic novels of the time) - but it’s probably the Margheriti most American viewers have seen, since it was distributed widely to stores by Columbia Home Video. Perhaps it opened the door to fans seeking his other output. The costumes are certainly a sight to behold - in the first half of the movie, the raggedy cavemen duds make you think at any moment one of the characters is going to say “It’s...!” and an episode of Monty Python will begin. Once we get to the futuristic section later, there’s even more greatness and creativity. Why is it in the future, breastplates are so popular? That nagging question aside, we get some nice laser action (because lasers were gigantic in the 80’s, never mind Laser Tag and Photon, just ask Judas Priest) - and the laser guns look more like car accessories, but who are we to say what laser guns will look like in the future? Anyone who reads this site knows that we are big Reb Brown fans, and the fact that here he teams up with the great Antonio Margheriti behind the camera is truly a dream team. 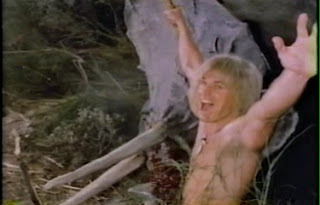 Brown plays the aforementioned oiled-up dude in a loincloth (OUDIAL for those on the go) with typical aplomb. Though this was so early in his career, he had yet to fully perfect his trademark scream. But he has amazing hair (especially for a prehistoric guy) and looks oddly like James Van Der Beek. 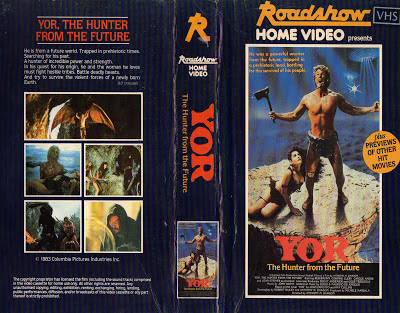 Was this VHS tape ever put in the horror section of any video store? Speaking of which...this movie does introduce the public to “triceratops gore” which no doubt we’ve all been clamoring for. There is some amazing music on the soundtrack. It’s not said who did the actual songs in the end credits. We know the music was by the great DeAngelis brothers, along with John Scott, but did they do the Queen-like tunes as well? It’s never said what those songs are. But no doubt they were recorded to hop on the bandwagon of yet another popular movie of the day, Flash Gordon (1980). Anyone who doesn’t like this movie is just too logical. Turn off the logical part of your brain and just go with the flow. If you do, Yor gonna love it. Also check out more YOR write-ups from our buddies, DTVC and The Video Vacuum! Got the VHS with the german title "Einer gegen das Imperium". I'm pretty sure if I ever buy a some sweet 80's ride like a red Corvette or a DeLorean, I'm getting 'OUDIAL' as my vanity plate. I remember seeing this flick in our local video store, but never pulled the trigger. Haha. It will be the best license plate ever. It is definitely worth-seeing! You will enjoy the Reb factor of it all. Shocked that you didn't mention the pterodactyl hang glider! Haha, we would have mentioned that, but it almost seems like a funny spoiler.